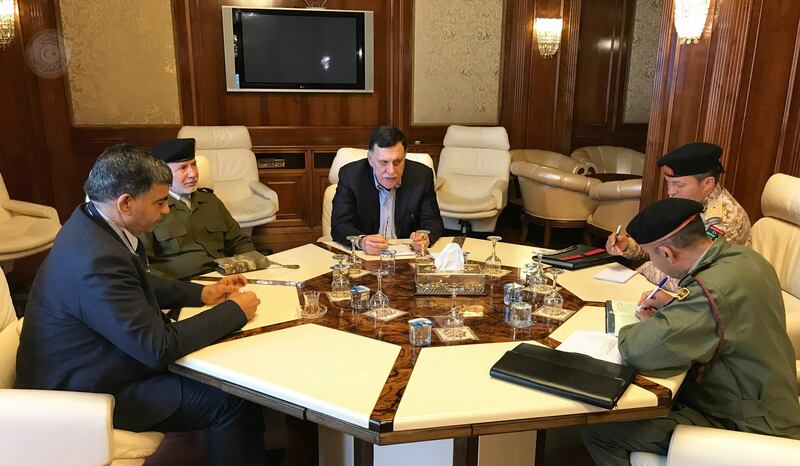 The Head of the Presidential Council Fayez Al-Sirraj met Tuesday with the commander of the western military zone Osama Al-Juwaili, the commander of the central military zone, Mohammed Al-Haddad, commander of the Tripoli military zone Abdelbasit Marwan as well as the Interior Minister, Abdelsalam Ashour, reported Al-Sirraj's media office. Al-Sirraj stressed to the attendees the need to fight outlaws, saying he won't allow anything to let Libyans down and deprive them of good economy and security. The meeting resulted in an agreement to have a mechanism to coordinate among them in security and military matters across Libya.